Dellin Betances blew a one-run lead in the eighth inning, sending the New York Yankees stumbling into their final regular season series against baseball's best team with a 3-2 loss to the Toronto Blue Jays on Sunday. 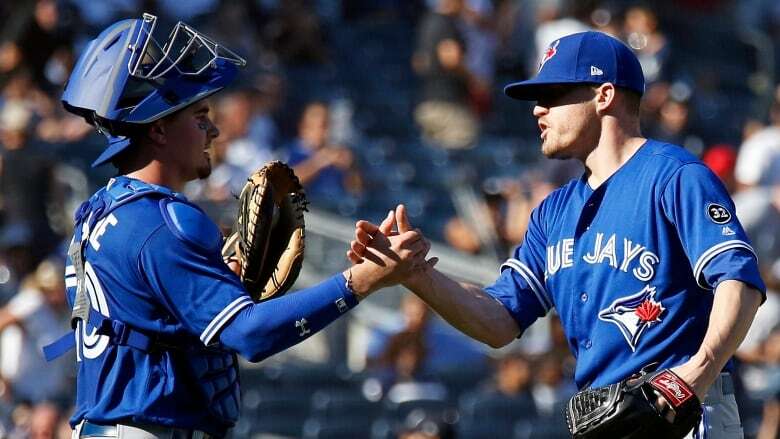 Dellin Betances blew a one-run lead in the eighth inning, sending the New York Yankees stumbling into their final regular season series against baseball's best team with a 3-2 loss to the visiting Toronto Blue Jays on Sunday. Betances (4-6) allowed hits to four of his first five batters, including a tying single by Rowdy Tellez and a go-ahead double by Randal Grichuk. Betances has lost in two of his past three appearances. "This one's on me," Betances said. "I take the blame on this one." The Yankees maintained a 1 1/2-game lead over Oakland for the top AL wild card after the A's lost to the Tampa Bay Rays 5-4. New York has a magic number of six to clinch a playoff spot after dropping two of three to Toronto. The Yankees are 7-10 in their past 17 games. Blue Jays edge Yankees in series finale. "We have to play better, clearly," Boone said. "We're not playing our best right now. But the history of this game is littered with stories of teams that went into the playoffs in different scenarios. Limping, playing great. The bottom line is you have to be playing right when it counts. Don't mistake that for, `This is OK,' but I still believe at my core that we have everyone in that room to do something special." New York opens a three-game home series against major league-leading Boston on Tuesday afternoon. The Red Sox are assured of no worse than a wild card, lead the AL East by 11 1/2 games and have a chance to clinch the division in the Bronx. The Yankees hope Aaron Judge can help keep Boston's bubbly corked. Manager Aaron Boone said the all-star slugger could return to the lineup during the series. Judge hasn't been cleared to hit against live pitching since breaking his right wrist July 26. The Yankees are 26-22 since Judge was injured. Toronto closer Ken Giles struck out Gary Sanchez with a runner on to end his second save in two days. The hard-throwing right-hander has 10 saves since he was acquired from Houston and 22 overall this season. Lance Lynn covered five one-run innings with 80 pitches for New York, and David Robertson followed with two hitless innings for his longest outing of the season. That preserved a 2-1 lead from Andrew McCutchen's leadoff homer and Didi Gregorius' sacrifice fly in the first. Betances couldn't hold that edge. He only escaped the eighth after a baserunning blunder by Tellez led to an out at home plate before Teoscar Hernandez flew out to centre. Betances also struck out a batter, extending his AL record to 41-consecutive relief appearances with a punchout. Yankees star Giancarlo Stanton singled and reached third on a two-base error with two outs in the eighth, but Mark Leiter Jr. struck out Aaron Hicks swinging to strand him. McCutchen hit his fourth homer with the Yankees on the second pitch from Thomas Pannone (3-1). It was the 12th career leadoff homer for McCutchen, who has slotted in nicely atop New York's lineup. The former Pirates star entered the game with a .421 on-base percentage since being acquired from the Giants on Aug. 31. Pannone faced the minimum over the next five innings, then stranded two runners in the seventh. He allowed four hits and two runs over seven innings, striking out six. The soft-tossing rookie left-hander was making his fourth start, including impressive outings against the Orioles and AL Central-champion Indians. Reese McGuire got his first major league RBI in the third with a double that cut New York's lead to 2-1.